1. 1. Preheat a fan-forced oven to 200°C and place pizza stones or oven trays in the oven to heat – this will ensure a crispy pizza base! 2. 2. Spoon pizza sauce on to McCain Regular Crust Pizza Base and spread evenly. Top with desired toppings and bake for 15 minutes or until base is crispy and cheese is golden and melted. 3. 3. Remove pizza from oven, top with fresh oregano leaves, cut into even slices and serve immediately. 1 1. Preheat a fan-forced oven to 200°C and place pizza stones or oven trays in the oven to heat – this will ensure a crispy pizza base! 2 2. 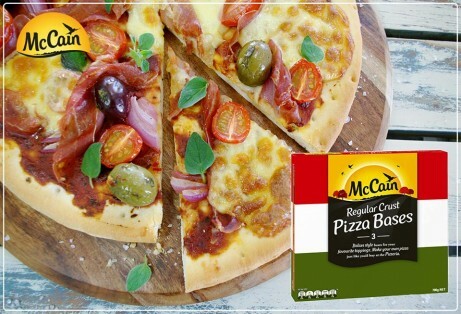 Spoon pizza sauce on to McCain Regular Crust Pizza Base and spread evenly. Top with desired toppings and bake for 15 minutes or until base is crispy and cheese is golden and melted. 3 3. Remove pizza from oven, top with fresh oregano leaves, cut into even slices and serve immediately.